1. Short curly wigs for black women, with super bouncy and pretty curlys, make you different 2. Made of 100% Heat Resistant Fiber, suitable for long term daily use or party use 3. 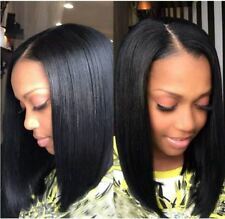 Black wig for women with natural looking, soft touch, just like your own hair 4. 100% elastic net makes you comfortable when you are wearing it. 5. The item is easy to wash and care for by using a little mild shampoo in cold water. 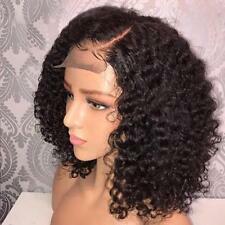 Features: Short curly wigs for black women, with super bouncy and pretty curlys, make you different Made of 100% Heat Resistant Fiber, suitable for long term daily use or party use 100% elastic net makes you comfortable when you are wearing it. Black wig for women with natural looking, soft touch, just like your own hair. Product intranet: front lace elastic net. 100% elastic net makes you comfortable when you are wearing it. Applicable skin tone: any skin tone. Hair material: Korean silk. Applicable face: any face type. Hair Color: Bleached 613 Blonde. Lace Material&Color: Swiss Lace in dark brown. Cap Construction: Lace Front. Parting: Customized middle parting, but you can free parting on lace area. Hair Texture: Straight. Grab the wig's sideburns. Hold it down and pull the wig back. Can hot dye: not hot. Intranet: Front Lace elastic net. Hair NET to wear All hair plug into the net. Leave the hair on the head. Place the net on the forehead. If you desire a softer change to your synthetic hair piece, a bottle of Roux Fanci-full Hair Rinse is a great solution. To evenly distribute the colouring throughout the hair, pour it into a spray bottle. Put the wig on your head. Grab the corner of the wig. Hold down with one hand and pull back the wig with one hand. Material: chemical fiber. Intranet: front lace stretch net. All hair is stuffed into the hair net. Lady High Ponytail Claw Jaw Clip in Pony Tail Natural Hair Extensions Curly Wavy. 70CM Princess Elsa Anna Snow Queen Frozen Weaving Braid Cosplay Wig Adult Cap UK. 35CM Short Curly Brazilian Natural Bob Ombre Fluffy Hair Lady Casual Cosplay Wig. Product intranet: front lace elastic net. Hair material: Korean silk. 100% elastic net makes you comfortable when you are wearing it. Applicable skin tone: any skin tone. Applicable face: any face type. Item type: Wig cover. Hair material: High temperature silk. Applicable people: Female. For skin color: Natural skin color. Style: Fashion. Applicable face: Any face. Different computers show different colors, the actual project color may change slightly. We are a wig factory!!! Material: high quality synthetic & high-temperature resistance fibers. headgear with adjustable button match all head styles. as normal situation. color: (as below). 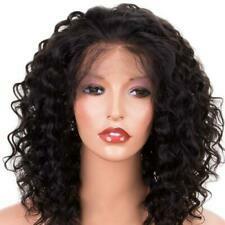 Most Natural looking Crochet Lace Front Wig 12”. This beautiful Million Braids Twist Wig With Lace Closure - colour Black 10-12inches feather/shoulder length is up for sale to a lucky buyer. We want to restock and sell out our wigs that is why we are giving it out at this price. Dispatched with Royal Mail 1st Class. Thanks for buying. Style: Curly. Lace Wig Type: None Lace Wigs. Item Type: Wig. Fiber: Heat Resistant Synthetic Fiber. Material: Synthetic Hair. Net Weight: 160g. Wigs Type: Natural Wigs. Length: Short. 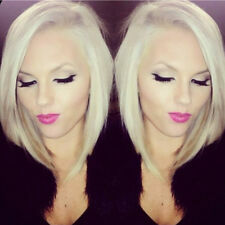 Hair Color: Dark Roots to Blonde, Ombre Blonde Brown. Lace Material&Color: Swiss Lace in dark brown. Cap Construction: Lace Front. Parting: Customized middle parting, but you can free parting on lace area. Item:100% new Full wig. Heat resistance:180℃(The wig can be marceled or straightened under 180℃). Intranet: elastic net. Material:100% High-quality High-temperature Synthetic fiber. We'd like to settle any problem in a friendly manner. Fashionable and stylish hair wig looks natural, real, very pretty and feminine;. 1 Wig cover. Every one have their individual definition for colour, and under different conditions the colour will look different. Very stylish design with natural pretty looking and soft wigs. Note: Due to the difference between different monitors, the picture may not reflect the actual color of the item. Due to the light and screen difference, the item's color may be slightly different from the pictures.